This unique Easter decoration features a swirl of branches and plant stems, yellow and white flowers and clusters of yellow berries. Mixed in are assorted pastel color eggs with a stippled finish. 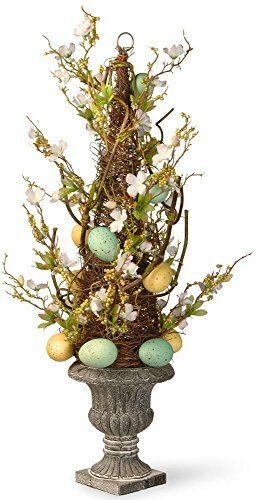 All are anchored on a cone of woven branch vines seated in a decorative urn base.This unique Easter decoration features a swirl of branches and plant stems, yellow and white flowers and clusters of yellow berries. Mixed in are assorted pastel color eggs with a stippled finish. All are anchored on a cone of woven branch vines seated in a decorative urn base. -Decorative urn base. -Indoor or covered outdoor use. -Yellow and white flowers and pastel eggs. Product Type: -Topiary. Plant Type: -Moss/Flowering. Orientation: -Floor. Plant Material: -Other/Plastic. Base Included: -Yes. Outdoor Use: -Yes. Plant Color: -Green, blue and yellow. Holiday Theme: -Yes. Seasonal Theme: -Yes. Base Color: -Gray. Base Material: -Plastic. Base Shape: -Urn. Base Type: -Urn. Holiday: -Easter. Season: -Spring. Dimensions: Overall Height - Top to Bottom: -27". Overall Width - Side to Side: -8". Overall Depth - Front to Back: -8". Overall Product Weight: -2.2 lbs.